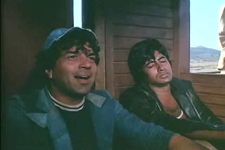 In an age of cosy family dramas and neat endings, Sholay blazed across Indian screens with a garrulous nonchalance, emboldened by the irresistible rakish swagger which permeated the very air around the still-raw-at-the-edges Amitabh Bachchan, and, at the same time, softened somewhat with Dharmendra's roguish innocence and fickleness. Sholay began slow and through sheer word-of-mouth service, achieved a cult status that is yet unsurpassed in the 100 years of Indian cinema. It was the Shakespeare moment in Hindi cinema, where the dialogues in a narrative trickled into the vernacular and became an inextricable part of the overall Indian linguistic culture. "Kitne aadmi the? ", asked fathers when their guiltily squirming progeny returned from late night parties, "Tumhara naam kya hai, Basanti? ", asked the street-side romeos of their respective inamoratas, "Hum angrezon ke zamane ke jailor hain", thundered moustachioed prison wardens all across the country, and "Jo daar gaya, samjho maar gaya" quoted young school children when they proudly stuck chewing gum to the teacher's seat and tried to coax their friends into doing the same. As Shekhar Kapur said, "Indian film history can be divided into Sholay BC and Sholay AD". It would really not be necessary to re-tell the premise of a film that has been promoted as "the greatest story ever told". Jai (Amitabh Bacchan) and Veeru (Dharmendra) are hired by Thakur Baldev Singh (Sanjeev Kumar), a former policeman, in order to capture the notorious dacoit Gabbar Singh (Amjad Khan), who has been terrorising the village of Ramgarh. 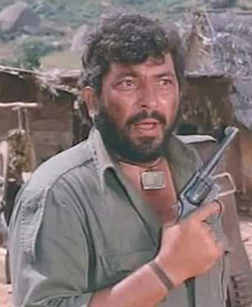 Thakur has a personal vendetta against Gabbar, and he needs help in exacting his revenge. On the way, Veeru falls for the feisty tonga driver Basanti (Hema Malini at her prettiest), and the world-weary and cynical Jai finds himself inexplicably fascinated with the Thakur's widowed daughter-in-law Radha (Jaya Bhaduri). The mercenaries have numerous encounters with Gabbar, wherein they learn of his diabolical penchant for sadistic violence. Numerous chase scenes and gunfights ensue, and the Indian audience ends up being mesmerised every single time. Make no mistake - the film was never terribly original, having borrowed rather generously from films like Kurosawa's "Seven Samurai", and renowned Westerns like "Once Upon A Time In The West" and "The Magnificent Seven". But while Kurosawa's film is unbearably bleak from the beginning, what with a relentlessly intense portrayal of the plight of an impoverished farming community in feudal Japan which is regularly ransacked by dacoits, Sholay was all about the sass and the style. Where Kurosawa concentrated more on the villagers and their desperate quest for mercenaries and samurais who could protect them, Ramesh Sippy, Sholay's director, concentrates more on the triad formed by Thakur-Jai & Veeru-Gabbar, thus establishing a dynamic debate involving social order, external usurpers and pseudo-anarchist enforcers. No wonder scholars still study the movie in their film studies courses. The film heaves and hulks about with pulsating masculine energy. Even Basanti does not conform to popular feminine norms of demureness and grace. In fact, the chase scene where Basanti is being hounded by a handful of dacoits and she manoeuvres her horse cart with all the recklessness of a James Bond, all the while egging on her precious steed, Dhanno (perhaps the most popular horse in pop culture), with characteristic brusqueness is, according to us, one of the best chase scenes in the film. Give us Dharmendra and AB on a train, fighting muscled paunchy goons with their bare hands over "Shettyfied" flying cars any day. ANY. DAY. As can be gleaned from the excessive gushing that has dominated the review so far, we do consider Sholay to be hallowed ground. "Thou shalt not fault Sholay" is this reviewer's one commandment when it comes to engaging with dedicated film dogmatists (like her film studies professor, who is an ardent World Cinema hawk and who has still not found anything majorly wrong with Sholay). But, yeah, now to the 3D part. What were they thinking? Honestly, WHAT were they thinking? We could discern only three or four frames where the 3D was apparent. The film's cinemascope lensing was what made it memorable. Watching Sholay, in all its vintage 70 mm glory, was a celluloid ritual that does NOT need to be airbrushed into the tweetage. Supposedly, Rs. 25 crores were spent in re-touching the film - complete with the 3D, and the re-mastering of scenes. Our question is - why? Have we become so obsessed with perfection that we need to stamp the signs of our "progress" on all the milestones that have led to this point? Are we incapable of enjoying anything spectacular until we have made sure that it has been "upgraded" and "updated" with the most cutting edge technology? Or are we simply running out of ideas, so that in a fit of petulant creative impotence, we move on to find faults with the old ones? What do ya know, they'll be re-painting the Sistine Chapel next! We're sure Michaelangelo got some noses wrong the first time around. One would be remiss to think that 3-D'ing any movie, old or new, is a creative choice (except in rare occasions like Gravity, where it truly adds depth). It is all about business, it is about making that extra dollar or rupee on the glasses. As simple as that. The producers are not fools to invest 25cr in converting the movie if they don't think they can bring in twice that amount (conservatively speaking) with the reissue. And this the only way that Sholay could be brought back to the bring screen and have people pay for it to see it - they couldn't re-colorize it, like Mughal-E-Azam or remix the soundtrack. So 3D was purely a business decision. fullhyd.com has 700,000+ monthly visits. Tell Hyderabad what you feel about Sholay (3D)!